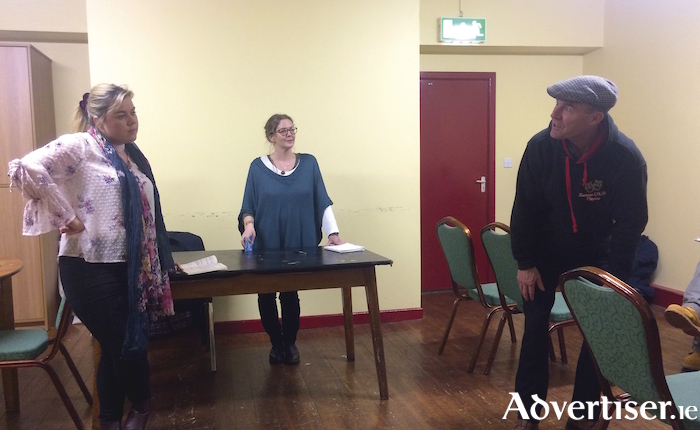 Seamas O’Kelly Players Lorraine Lynch (Kate), Carmel McCarthy (Maggie) and John Lawlor (Byrne) in rehearsal for Big Maggie. MAGGIE POLPIN is a mother, a widow, and a shop owner. Not only does she have these three roles to contend with, she must also battle against the expectations, morals, and judgments of her small town neighbours. John B Keane's Big Maggie, first staged in 1968 and generating much controversy for its portrait of a woman determined to take back control of her life, will be performed by The Seamas O’Kelly Players in the Temperance Hall, Loughrea, on Thursday March 1, Saturday 3, and Sunday 4 at 8pm. Tickets are €10 from TL O’Brien’s, Main Street, Loughrea, or €12 on the door. For more information call 083 - 8633796.